Now, here’s what I don’t understand. Why did you come to this country if you hate us? Or, did you learn to hate us so quickly after arriving? 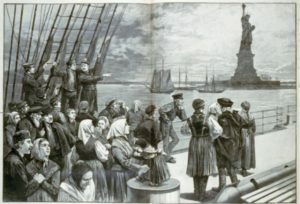 Did you think being an immigrant in the U.S. was supposed to be easy? I can assure you that integrating into a new society is not easy…it is simply opportunity. When my father came to this country from Italy in 1947, two years after the end of the Second World War (in which his country and ours were on opposite sides), it was not easy. He took what work he could…and the ethnic insults that came with it. When I was born a year later, my parents took out a small insurance policy in the hopes that I – their future – could go to college. As a child from an immigrant family growing up in the Bronx in what was then the largest housing project in the world, I bore insults and fought because of my ethnicity and my pride in it. Many of the people I fought were from another ethnic group that had come a generation earlier and saw me and mine as intruders in what they had struggled to achieve. But this is America. I also made friends and never doubted that my father or I were any less American than the people I fought. There is no question that – because many people tend to generalize – it is a time of difficulty for American Muslims. Yet, it is also a time of growth and opportunity for a greater voice. Like the groups who came before, this is a time of progression, not an end point. America’s greatness and its offer to those who come has been its flexibility to evolve and absorb. That is why so many who have immigrated to the U.S. across many generations think for the long term…think and build for their children’s success. Now you’re dead. You had begun to take advantage of the opportunities this country has to offer…the ones we fight to continue in our political discourse. I wonder if you had lived longer whether those values would have changed you. I wonder how much you took from your parents and from us all.